Americana — Environmental forum and International trade show for environmental technologies — will take place on March 26, 27 and 28, 2019, at the Montréal Convention Center. 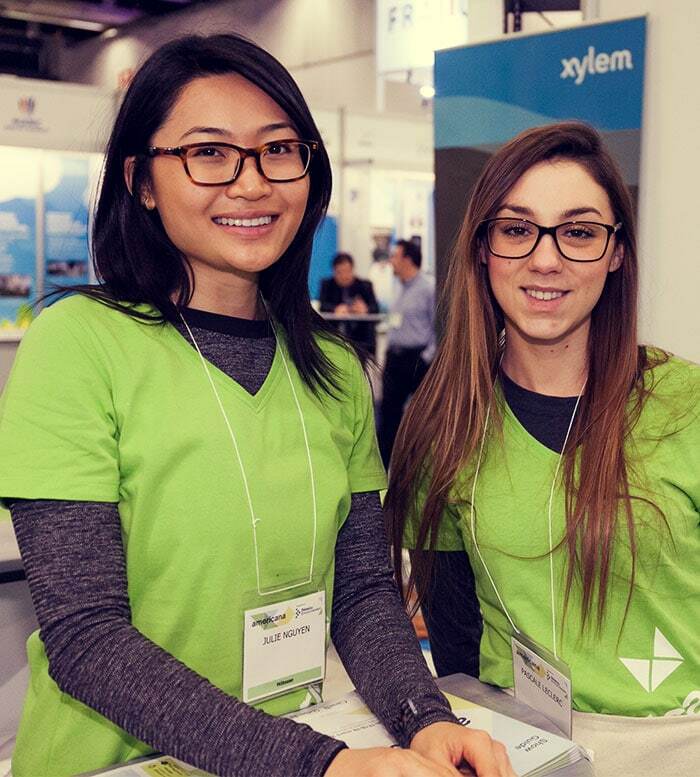 Don’t miss this opportunity to attend the largest multi-sector environmental event in North America, with over 200 presentations, 350 exhibition booths, and over 10,000 attendees from over forty different countries. You want to participate in Americana? You can participate as a delegate and attend conferences, visit Trade Show only, participate as an exhibitor, speaker, volunteer or partner. Our one, two, and three-day packages give you access to the presentations and exhibit hall. Refer to the following grid, and click on the price of the package of your choice to register. 1 Member in good standing of Réseau Environnement. 2 Proof of full-time student status is required. All registration cancellation requests must be submitted in writing to the registration office before January 23, 2019. No refund shall be provided as of January 23, 2019. Interested in joining the largest network of environmental experts in Quebec, to enjoy Americana’s member rates and many other benefits? Visit Réseau Environnement’s website for more information. You can purchase a ticket to visit the exhibit hall only, at a cost of $35 for all three days if purchased before March 1st. After this date, the cost will be $40. You can purchase a ticket to assist to the lunch-on presentation on March 27th, at a cost of $100 if purchased before March 1st. After this date, the cost will be $115. Would you like to participate as an exhibitor, partner or volunteer? Do you wish to offer an exhibition booth during Americana? Refer to the Become an exhibitor section for all the details. Do you wish to give a presentation at Americana? Refer to the Presentations section for all the details. Interested in becoming a partner of Americana 2019? Please read our partnership plan to find out about all partnership and booth rental options. We are currently recruiting volunteers! By meeting speakers, exhibitors and other attendees, you’ll have the opportunity to develop your network and deepen your knowledge of the industry. You’ll also be given free access to the presentations and exhibit hall on the days when you are not volunteering. In addition, you’ll get a free one-year membership to Réseau Environnement (for students) or a 50% discount on said membership (for professionals). An educational and profitable opportunity! Be available for one full day on March 26, 27 or 28, 2019. Download and complete this form in french. Send it with your résumé before February 15, 2019.